Dr. Finney is Professor of Practice at the University of Pennsylvania and Director of the Institute for Research on Higher Education (IRHE). She teaches graduate courses in the public finance of higher education, public policy and higher education, and an advanced public policy seminar in higher education. She was vice-president of the National Center for Public Policy and Higher Education from 1997-2007. She has also held senior policy positions at the California Higher Education Policy Center and the Education Commission of the States. For over twenty-five years, Dr. Finney has worked with state and national leaders on improving public policy for higher education. Dr. Finney has testified before state and federal legislative bodies. She has advised gubernatorial campaigns and fact-checked statements made by presidential candidates on higher education issues. Dr. Finney is also a frequent speaker, a resource for the media and not-for-profit organizations. Dr. Finney is a founding board member of the National Clearinghouse Research Center and Research for Action. 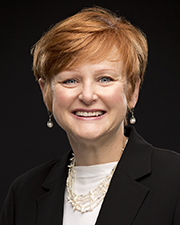 She chairs the national selection committee for the Virginia B. Smith Innovative Leadership Award sponsored by the Higher Education Policy Institute and the Council for Adult and Experimental Learning. She also serves on the executive committee of Change: The Magazine for Higher Learning, and is on the Editorial Board of the Journal of Competency-Based Education. Finney pioneered the development of the nation's first report card on higher education, Measuring Up. She currently researches state policy and its relationship to state performance; she also assists states in developing public policies to increase educational attainment and reduce gaps in performance. Most recently, working with colleagues across the nation, Finney co-authored Financing American Higher Education in The Era of Globalization (2012) published by Harvard Education Press. She has also written two other books: Public and Private Finance of Higher Education: Shaping Public Policy for the Future and Designing State Higher Education Systems for a New Century. Dr. Finney’s current research projects focus on the finance of higher education, particularly college affordability for students, families, and taxpayers. She recently directed a national research project at Penn related to how public policies influence higher education performance. Along with her colleague Laura Perna, Dr. Finney completed five in-depth case studies of Georgia, Illinois, Maryland, Texas, and Washington. The results of this study can be found in The Attainment Agenda: State Policy and Leadership in Higher Education by Johns Hopkins Press (2014). She recently added the state of California to this body of work. Dr. Finney has also worked extensively in the area of public policies related to higher education finance, collaborating on Financing Higher Education in the Era of Globalization, which chronicles the development of higher education finance from WWII to the most recent recession (with William Zumeta, Davin Brenman, and Patrick Callan). She has written two other books, Public and Private Finance of Higher Education: Shaping Public Policy for the Future and Designing State Higher Education Systems for a New Century (with Richard Richardson, Kathy Bracco, and Patrick Callan. Read more about Dr. Finney’s book, Financing American Higher Education in the Era of Globalization.